It’s obvious that vehicles are something we rely on as part of a normal life. When something happens to your transportation, it can be extremely frustrating. Wouldn’t it be great if you could fix the problem yourself? With automotive mechanic training, you can. 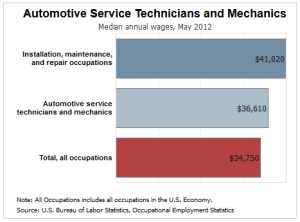 According to the Bureau of Labor Statistics, an automotive service technician’s median annual salary for 2012 was $36,610. The job growth rate is projected to be 9%, which means that by 2022, an extra 60,400 jobs will be created. 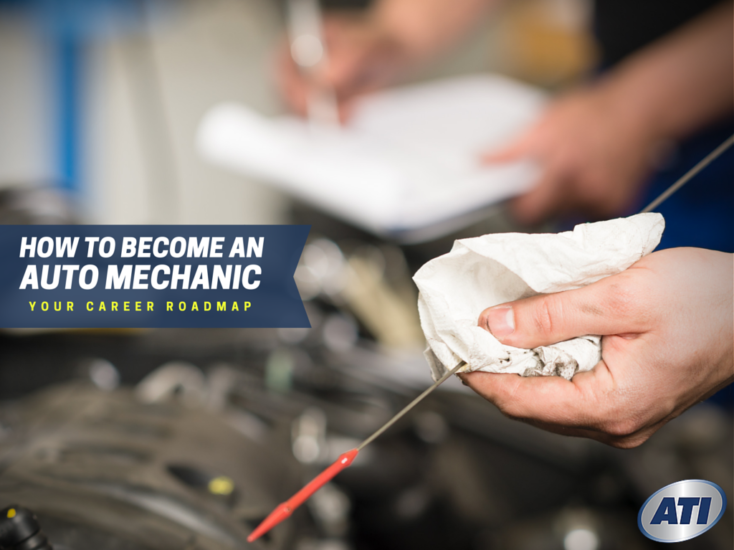 Becoming an automotive mechanic can be a great career option but what exactly does it take to become one? What is an Automotive Technician? What Does an Automotive Technician Do? Examine and Identify Issues – Automotive technicians have to be able to thoroughly inspect each vehicle that comes in. They may be required to use a checklist of specific areas to test, as well as anything the client wants checked. They will then have to figure out what, if any, are the problems affecting the vehicle. Perform Maintenance – A majority of the regular business automotive technicians will be responsible for is regular maintenance of vehicles. This can include things like: oil changes, tire rotations and filter installations. While the general maintenance may be the same, each car is different so this isn’t a repetitive task that get boring quickly. Repair and Replace Parts – Once a problem is identified or regular service needed, technicians will have to take apart and replace parts. Automotive technicians will have to know what parts go where in different vehicles and how they should fit. They must also replace old or broken parts with the correct replacement part. Use Equipment – Automotive technicians have to be able to use all different kinds of equipment to check and fix a vehicle. Tools used include traditional manual devices like wrenches. It also includes power tools, jacks, hoists and computerized and electronic equipment. Talk to Clients – Automotive technicians should also be able to talk to clients and communicate effectively. They will have to explain any issues with a vehicle as clearly as possible and the best choice for resolving it. Any courses in automotive repair, computers, mechanics, English, electronics or math provide a good base for prospective auto techs. The fast advancement of automotive technology and the complexity of most vehicles today means many employers prefer people who have gone through a dedicated program. Automotive service programs give students the opportunity to learn through both classroom and hands-on methods. Some programs also include an apprenticeship where students can learn on the job from other technicians and mechanics. After graduating, new technicians tend to continue training at a job and working up the ladder as they gain experience. Automotive technicians will also typically become certified as most employers require it. Certification is received through the National Institute for Automotive Service Excellence. Certification is the best way to demonstrate skills and competency to employers and can get you higher paying positions. Automotive technicians can become certified in eight different areas. To advance and become a master technician, automotive technicians must pass all eight of the certifications. There is also an exam and license requirement for automotive technicians that handle refrigerants. Some programs will include classes to cover the material included in the exam. How Long Does It Take to Become an Auto Mechanic? If you are interested in a career as an automotive technician, contact Advanced Technology Institute (ATI) for details on earning an Automotive Technology with Service Management (AOS Degree) in as little as 19 months through our year-round curriculum. Contact us today at 800-468-1093 or request information on our website and get on the road to success! DISCLAIMER – Advanced Technology Institute (ATI) makes no claim, warranty or guarantee as to actual employability or earning potential to current, past or future students or graduates of any educational program offered. The Advanced Technology Institute website is published for informational purposes only. Every effort is made to ensure the accuracy of information contained on the AUTO.edu domain; however, no warranty of accuracy is made. No contractual rights, either expressed or implied, are created by its content. For more information about Advanced Technology Institute or any of our programs click here: http://www.auto.edu/ or http://ow.ly/VoydP. How do I become a Mechanic With No Experience, but a Formal Degree? Learning How to be an Auto Mechanic: Is It Right for Me? What Are the Automotive Tools Used in Repairing Cars and How Can I Learn To Use Them? What Are the Main Duties of a Mechanic? Will I Need Formal Training in this Profession?